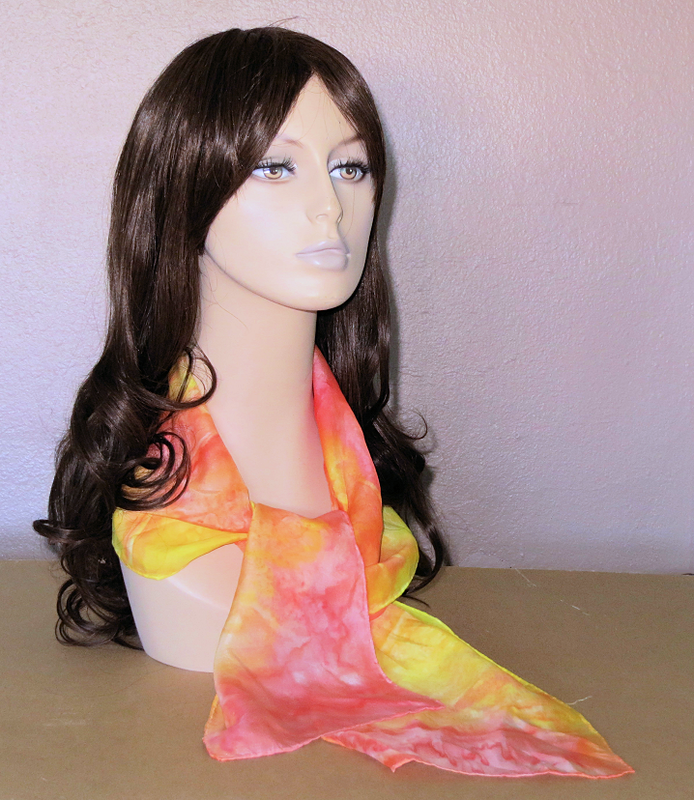 Recently, I started working with silk and Dye-Na-Flow fabric paint. Don't ask me how I got into working with silk. My original intent was to make my own fabric designs for Christmas presents. That turned into making stuff for my TRGatesArt on Spoonflower shop (of which I had forgotten about for a while). To buying ready made fabric to go through my printer. To ordering Bubble Jet Set and rinse to make my own fabric to go through the printer. Finally, to painting on silk. Okay, there was a few more steps in between. One of the ready made printer fabrics I bought was silk. While I waited for the Bubble Jet Set to come in the mail for the muslin I had on hand, I was so impressed by the ready made printer silk that I decided to buy a few yards of Habotai silk as well. It's thin and economical, yet fun to try things out on before going to anything more expensive. Of course, the site I found the reasonably priced silk on happened to have loads of information on dying and painting on all types of fabric. On impulse, I bought the Jaquard Dye-Na-Flow mini starter set. These are tiny 1/2 ounce trial sized bottles. I wasn't sure they'd be enough, but turns out they're concentrated. I've made two scarves and still have plenty left. Dye-Na-Flow are paints, but they work and feel a lot like dye. I chose them because most of the other dyes and such used on silk required steaming. 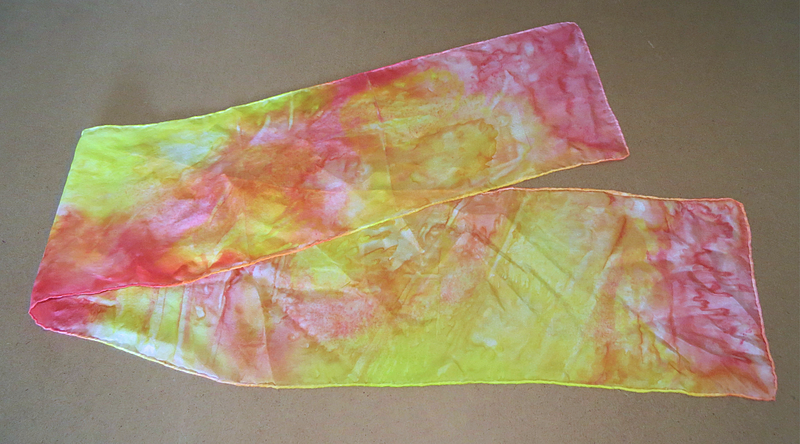 These watery paints work by letting them dry, then heat setting with an iron, or dryer. Finally, washing and letting dry to make permanent. The painting process was short and sweet. In fact, the longest part of making the scarf was in the waiting for 24 hours before heat setting it with an iron. Second longest was in making the hand rolled hem, which took me a few hours since it was my first time and the phone kept ringing. The painting itself took less than ten minutes. 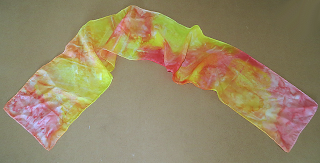 With this scarf, all I did was lightly wet the silk, then mixed a few drops of the paint with water and dabbed on with a sponge brush. I wanted some white to show through, so left some areas as is. I also sprinkled on some Epson salt here and there to give more texture to it. I left the scarf on a plastic bag that had been taped to a folding table and let it dry in the warm sun (took less than 30 minutes). Then I carefully rubbed off the salt and let it sit for the 24 hours recommended, iron set and then hand washed it. True, some of the color came out in the final washing, but not much. It's still bright. I have another one I'm working on using the sun painting technique. It looks lovely so far. Unfortunately, I forgot to hem it first. So, I may have to re-dye the edges and thread once I do. But hey, it's all a learning experience. Right?